Good morning, Jessica here! 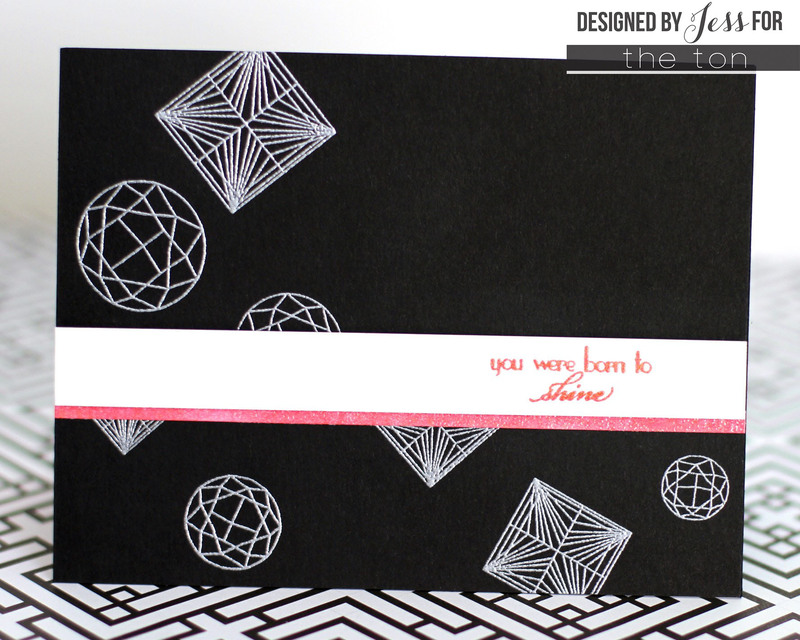 Today I’m sharing a card using the Round and Princess Cut Diamond stamp sets! I stamped them in versamark and then heat-embossed them with WOW Silver Pearl embossing powder. The powder gives the diamonds a beautiful sheen that changes color as it catches the light. Next I stamped the sentiment with Tsukineko Brilliance Rocket Red ink and heat embossed it with clear embossing powder. I adhered the sentiment strip to the card with foam mounting tape but it felt like it was missing something. So I smeared a little more Rocket Red ink onto a thin strip of cardstock, heat-embossed it with clear powder, and slid it under the sentiment. I think that pink really tied everything together! Thanks for visiting and see you Thursday! Don’t forget to check in on Wednesday for Ruby’s post! Love the set and your card! Agree that the added pop of color ties it together — great addition! This is a really cool card! !